Imagine a home that heats and cools itself without the need of a furnace or AC unit; one that produces its own zero emission supply of electricity, and is not dependent on a municipal source for water. This kind of house also processes all its wastewater locally, and can even grow a quantity of its occupants' food. Additionally the home is built with local and recycled waste products, using basic low-tech labor. Does this sound like the ideal residence in a space age future? Believe it or not, these homes, called "Earthships," exist today (many constructed by builders in New Mexico) and have been in existence for over 30 years. Find out more. 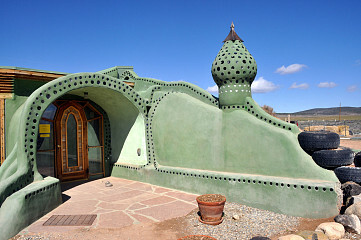 Earthships are homes built with passive solar design principles. During the cool winter months, low angled sunlight enters the home and warms the floors and walls. Exterior and load bearing walls are constructed with a core of up-cycled tires and rammed earth. This high thermal mass core is covered with concrete or soil-based plasters for a smooth and cosmetically appealing surface. The mass of the walls and structure absorb the sun’s heat, storing it temporarily and then releasing it back into the living space after the sun sets. In summer, the cool base temperature of the earth around the home provides natural cooling. This is supplemented with convective air flow and skylight vents. 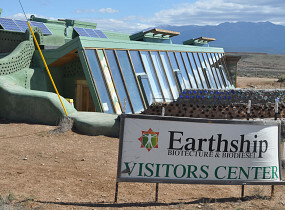 Earthships by their nature are off grid. This means they are self-sufficient in terms of electricity and traditional service utilities. Solar panels and/or wind turbines generate electric power. The home's roof surface acts as a collector for harvesting rain and snow. An Earthship’s water stores are processed by filtration and purification means for initial use. Greywater from sinks and showers is then passed through a biological/planter bed before being used to flush conventional toilets. These planter beds can also be used as gardens (some people grow food in greywater-irrigated gardens; some do not). Next, the waste water from the toilets is processed in an exterior system that can be used for landscape needs. Thus, the water is actually used four times…which is a great savings in its own right. Hot water for domestic use is produced via thermal solar power. One of the greatest advantages of Earthship construction is the use of reclaimed materials. 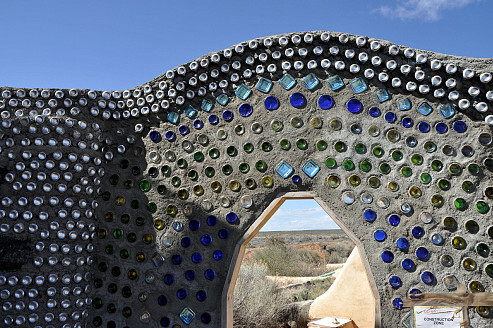 The fundamental “building blocks” of an Earthship include tires, bottles and cans. Earthship foundations begin with old tires that are filled with simple dirt. This local material is compressed into the form of the tire and provides a strong solid and dense “brick.” Walls of these tire bricks are erected on three sides of the structure, providing both thermal mass and support for the home roofing system. Interior and decorative walls are often built using bottles and cans as the “core” materials. This integrated “matrix” of concrete and containers reduces the total amount of mortar needed and can provide a great decorative element. Earthships are gaining in popularity and may be found in nearly every climate type. Some of the best known examples of this type of architecture and sustainable building style are located near Taos, NM. Here an entire “subdivision” of Earthships make up the “Greater World Community,” which has been in existence since 1996.